Ronaldo scored with a superb header and three minutes later created a scrappy second, breaking Welsh hearts in the process. Inspired by Cristiano Ronaldo, Portugal defeated Wales 2-0 at the Stade de Lyon on Wednesday to book their place in the Euro 2016 final, where they will meet either hosts France or world champions Germany. And when it came down to the ‘Battle of the Galicticos’ between Ronaldo and his Real Madrid team-mate, Welshman Gareth Bale, the winner was clear. Ronaldo scored his country’s opening goal in the 50th minute, with a superb header and three minutes later it was his low shot which was turned in by team-mate Nani to make it 2-0 and leave Wales with a mountain the size of Snowdonia to climb. 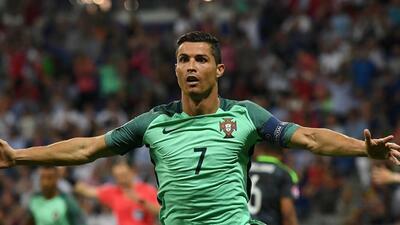 The 31-year-old Ronaldo has had his share of critics in this tournament having rarely delivered performances that live up to his stellar reputation and while Bale saw more of the ball, worked harder and never gave up trying to inspire his team to one more upset, it was the three-time World Player of the Year who provided the killer touch and proved the match-winner. It was one trial against the odds too much for a Wales team that sorely missed the influence of their suspended midfielder Aaron Ramsey but who deservedly took the applause of their travelling supporters after their first ever journey to the semi-finals of a major tournament. Wary of the twin threat of Ronaldo and Nani in the Portuguese attack, Wales began cautiously but played some intelligent possession football without really threatening to break through. Bale fired over the bar after a smartly-worked corner and also got to the byline where his dangerous, low cross wasn’t far away from Leicester City midfielder Andy King, chosen to replace Ramsey, who slide in at the near post. The best moment from Bale came when, wide inside his own half, he lured Danilo into an ill-advised challenge, floated past him and then sprinted deep into Portuguese territory before unleashing a low drive that was, however, too close to keeper Rui Patricio. Ronaldo had done little, floating around the frontline without ever really alarming the Welsh defence which was once again well-marshalled by captain Ashley Williams. But the winger had a half-chance to find the target just before the break when he headed wide from Adrien Silva’s cross from the left, which asked just a little too much of the Real star. Five minutes after the restart though, Ronaldo showed that his ability in the air, which he has honed over the years from a weakness into a strength, wasn’t too be underestimated. He soared high to reach a cross from Raphael Guerreiro after a short-corner and powered in a beautiful header which gave Wales keeper Wayne Hennessey no chance. Within three minutes Portugal had doubled their lead when a Ronaldo shot, not perfectly hit, was diverted into the goal by Nani to make it 2-0 and put the 2004 beaten finalists firmly in control of the game. Bale tried his utmost to turn things around but he was restricted to speculative long-range strikes which never really troubled Patricio. Wales will go home heroes regardless of this loss while Portugal now have a chance to put right their painful loss to Greece, in the 2004 final in their own capital of Lisbon. The winner of Thursday’s other semifinal, between the French and Germans in Marseille, will surely have other ideas however.